Note: This is taken from the story my fiancé and I wrote for our wedding website. We hope you enjoy reading it! You are also invited to watch the ceremony on our Facebook page this January (be sure to like the page so Facebook will notify you when we go live). Sometimes God works in ways that completely surprise his children…and go beyond their wildest expectations. In reading this brief summary, you will hopefully see the joy only He gives from how He brought Kate and Adam together. Their first connection was on an online dating site on April 5th of this year. Kate had been on the site for several years, having gotten on at her parents’ urging. She was beginning to wonder if her Mr. Right would ever find her. For a long time, she’d prayed something along the lines of “Lord, you created Eve for Adam; you can help my Adam find me,” never dreaming that God had a man actually named Adam in mind for her. And after three years of stressing and trying every way she could think to help her Mr. Right find her only to have every door slam in her face, she had finally come back to the point of surrendering again if she would ever get married. She went back to the joy she’d had in her 20s—content single—and was considering getting off online dating. Adam, meanwhile, had decided to stop dating after undergraduate college and to wait until he finished graduate school and his postdoc before looking for the lady God intended for him to marry. This past Easter, Adam, who was now finished and working back in his native state of Georgia, decided to make a couple of online profiles, as the right woman hadn’t showed up in his daily walk. Three days into it, he saw Kate’s profile and immediately saw something special, even if she was a long distance away (up in Virginia). On her end, Kate was not initially impressed by Adam’s profile. She was pretty sure he’d be another in a long list of guys that weren’t right. But he had one sentence in there that struck her: “I love science because I know it’s because of God that science works the way it does (it’s a reflection of His creation).” That and the note he wrote her struck her as unusually intelligent and honest. She decided to write back with her hardest questions to quickly chase him away…but was surprised by his answers…again and again. This man had the same passion for God’s Word (including how it applied to science and math), sharing the good news of salvation through Jesus Christ, and the church that she did. He saw life and the Bible the same way. She found her conversations with him uplifting—and he had the most amazing voice she’d ever heard that instantly relaxed her (she’d always had a thing for voices). Still, she wasn’t going to jump to any conclusions…she needed to know God was opening this door. Adam was also amazed at how much he had in common with this gorgeous woman. He had his doctorate in material science and engineering and a heart to declare God’s handiwork in math and science; she had written a curriculum to do just that. They both loved to play piano, especially hymns (she taught piano; he was a gifted performer). They both had experienced many trials in life they’d overcome through God’s grace. They both wrote volumes back and forth to each other and spent hours video messaging. They continued to realize how deeply their visions and views on life meshed…as well as how their differences complemented each other. 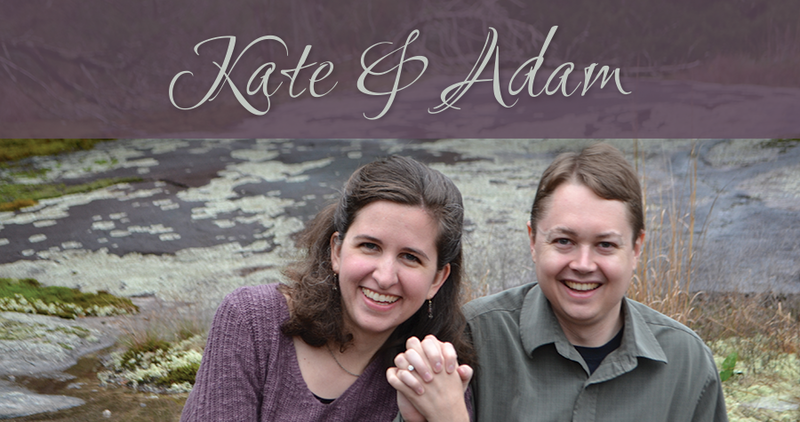 Kate’s diligence inspired Adam; she was amazed at his humility and desire to pursue God wholeheartedly. She could see the big picture; he could track the details. She reminded Him of the need to examine everything in God’s Word; he reminded her of the need to depend on the Holy Spirit and pray. She was awed at his honesty and forthrightness; he at how she reflected the love and grace of Christ. 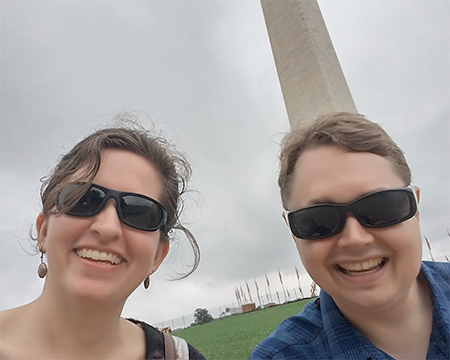 After a few months of long-distance communication, Adam was able to visit Kate on a work trip to a nearby conference (that Adam’s boss just happened to ask him to attend the week after they met online). They worked through the jumbles of meeting each other in person and, after much prayer, decided to embark on a “courtship.” They chose that word rather than dating to show that they meant the relationship to be a time of seeking God’s will in their lives. They decided to not hold hands yet (they saved that for engagement), and to save their first kiss for their wedding day. In the midst of all of this, life continued to happen. Adam lost his Maw-Maw that spring in May, and then his Nanny in July. Kate was finishing her degree and completed her last paper right before flying down to Georgia to meet Adam’s family for the first time. God used the stresses and unplanned things in life (such as a massive migraine and ear infection) to allow them to see how the other responded in everyday life…which only confirmed that He was indeed calling them together. In September, Adam was able to come up again to Virginia. While he was up, Kate decided to throw a graduation celebration to celebrate God’s faithfulness in finishing her degree in addition to healing her from her concussion and other infirmities (just four-and-a-half years prior, she’d still been in recovery, wondering if she’d ever get well after struggling for months) …and as an excuse to introduce him to some friends. They continued to see God drawing them together (including through life’s challenges, such as a near accident, a sprained ankle, and a cold) and realized that the remaining piece was getting Kate’s father’s blessing, something Kate had long ago decided not to get married without. Unbeknownst to Kate, her dad gave that blessing early in September…but they all kept Kate in suspense until early in October, when Kate’s parents were able to drive down with her to Georgia. She thought they were going to see Adam in his natural habitat…everyone else knew they were going in order to allow both sets of parents to celebrate the engagement together. Kate began to suspect something when she saw how nervous Adam was, but her parents were doing a good job hiding the fact that the blessing had already been given so she didn’t expect a proposal right away. Still, she’d fasted and prayed on the car ride down anyway, writing in her journal “I am at peace saying yes. Thankful for what God has given.” And she’d decided to buy Adam a turtle keyring (turtles are his favorite animal…and she’d long joked her Mr. Right was riding a turtle) for their six-months-since-they’d-first-corresponded anniversary, which was the day they arrived. She didn’t realize at the time that it was the perfect gift, as he’d then have a “ring” too. But much to her dismay, he didn’t want her to give him her gift that night. Instead, she was to be ready at 9 a.m. sharp for a walk the next morning—why was he stressing so badly about a walk? She soon found out, when he proposed to her on the granite rocks of Georgia, a symbol of the solid foundation of Christ and that they wanted to commit to serve Him together. He gave her his Maw-Maw’s ring, and her Nannee’s wedding ring as well as a symbol that he had indeed received her father’s blessing (she knew the ring…and he had a signed blessing card to prove it too :). The engagement occurred on the birthday of Adam’s Nanny and Kate’s Grandmom. To add to the surprise, her brother had flown down to be there when they returned to the house. There was a sweet time of celebration, and both families prayed over them. And that is their story in a brief nutshell. They are both awed at what God has done and look forward to what He has in store as they join together to serve Him. We have a butterfly, honeybee, eagle, and turtle theme. There’s a story to why. Early on in our relationship, Adam decided to write songs and poems personifying Kate as a butterfly and himself as a honeybee. The honeybee was an obvious choice given he is a Georgia Tech alumnus (their mascot, the yellow jacket, gets mistaken for honeybees easily); the butterfly was because Kate had a butterfly as her Gmail photo, and he seemed to think it fit, especially as she had spent time in a “cocoon” with a year-and-a-half-long concussion recovery a few years back, plus the spiritual analogy of being a new creation in Christ. And then, both insects pollinate flowers, and both of us want to help tend God’s Garden–His people. Eagles are Kate’s favorite animal, while turtles are Adam’s. Interestingly enough, Kate had often joked that her future husband was riding a turtle instead of a charger… They both discovered that the animals personified some of their natural attributes as well. Kate tends to see the big picture like an eagle; Adam is more focused on the details. Kate tends to fly from thing to thing; Adam tends to work steadily forward. So, the animals in a way represent how we complement one another. We’ve already seen how God uses our differences as well as our similarities for good.